Trieste, 27 January 2016. – A group of Italian politicians and speculators succeeded in forcing the Commissar of the Italian Government, in charge of the provisional administration of the Free Territory of Trieste, Ms F.A. Garufi, to sign yesterday night (26.1), three days before her retirement, acts which would allow the “move” to other areas the regime of international free port from the Northern Free Port, also referred to as the “old” port. The excuse for this action is deceptive and the operation is illegal, because the international regulations of the Free Port of Trieste forbid to remove the port areas under constrain, as well as allowing the free extension of the free port regime to new areas without need to remove it from the previously existing ones. 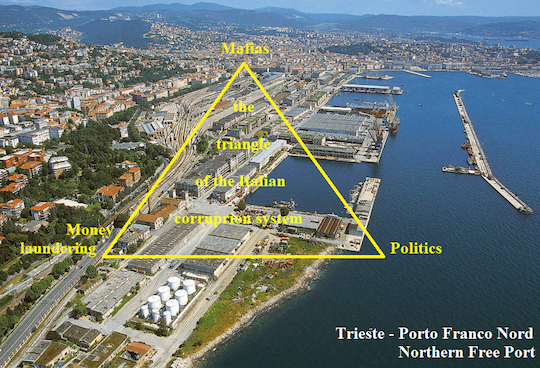 The operation has two real, illegal purposes: diverting to Italian ports the new Baltic-Adriatic traffics by eliminating the main immediate development area of the international Free Port of Trieste, and then using it for a building and housing speculation amounting to EUR 1,5 billions. Both actions are under relevant interest of the Italian mafias. The illegal operation does also violate the rights of the whole International Community on the Free Port of Trieste, established as a state corporation of the Free Territory of Trieste to grant free trades and traffic to all States, under the control of the Free Territory, France, the United Kingdom, the United States of America, Russia and other successor States of the USSR, Poland, Slovenia, Croatia and other successor States of the SFRY, Italy, Czech Republic, Slovakia, Switzerland, Austria, Hungary, the five of them having also the right to register vessels. The Free Trieste Movement – FTM does therefore declare and denounce, under its own responsibility, that the acts signed by Commissar Garufi are illegitimate, and provide the tangible evidence that the whole operation constitutes a massive international fraud, it is an intolerable scandal, organised by the networks of corruption and mafia that devastate the whole political-institutional system of Italy, including sectors of the judiciary that should prevent this kind of crimes. The Free Trieste Movement requests the punishment under criminal law of all those who made themselves responsible of this fraud – actively or passively – and it delegates the International Provisional Representative of the Free Territory of Trieste – I.P.R. F.T.T. to activate the procedures of international dispute established with the Treaty of Peace of 10 February 1947 (articles 87 and 88; articles 24 e 26 of Annex VIII) which established the present-day Free Territory of Trieste and its international Free Port under the direct protection of the United Nations, as confirmed also by document S/2015/809 of the Security Council and General Secretariat.